This is a photograph of the UK’s rarest fish, the Vendace. This specimen was caught on Loch Earn on the 23rd May 2012 around 9pm. by Graeme Harley from Strathyre fishing from a boat close to the mouth of the Kendrum Burn. It was foul hooked with a small toby lure just in front of the dorsal fin. The fish was returned to the loch immediately after this picture was taken. This is the second specimen that we are aware of being caught. The first was caught in mid July 2005 by Kirkcaldy angler John Nicol who was flyfishing near to the South Loch Earn Caravan Park and took his fish on a Kate Mclaren fly in about ten feet of water. This fish was frozen and subsequently passed on to myself for identification. I in turn passed the specimen on to Marine Scotland inspectors who dropped the fish of at the Freshwater Fisheries Laboratory in Pitlochry. They in turn passed the specimen on to Peter S. Maitland from the Fish Conservation Centre in Haddington who finally identified the fish as a vendace. 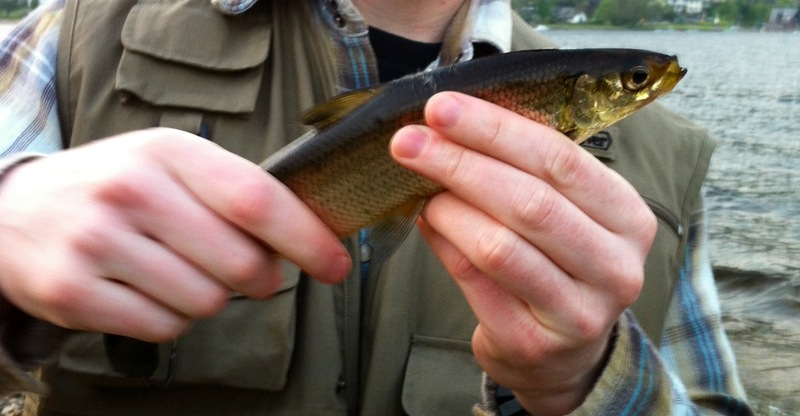 How did these fish appear in Loch Earn? Because of its rarity, vulnerability and decreasing distribution, the vendace in Great Britain is given protection under various legislative powers. It is included in Schedule 5 of the Wildlife and Countryside Act 1981 where it is illegal to capture, kill or keep in captivity vendace without licence. It is also included in Appendix III of the Bern Convention and in Annex V of the EC Habitats and Species Directive. In an appraisal of the conservation needs of British freshwater fish, Maitland & Lyle (1992) gave vendace the highest priority category. Special attention was given to vendace in Bassenthwaite Lake and in early December 1988 Swedish mixed mesh gill nets were used to catch vendace in Bassenthwaite Lake (Maitland & Lyle 1990). The catch included three ripe females and these were stripped and the eggs fertilised with milt from about 10 males. These eggs were then incubated at the Fish Conservation Centre, Stirling and the Institute of Terrestrial Ecology, Penicuik. Unfortunately, there was no provision made at the time for selection of an introduction site and in the spring of 1989 8,379 unfed fry hatched from these eggs were introduced to Loch Earn. Subsequently, although no special search was made for vendace in Loch Earn, netting for other unrelated projects (Alexander & Adams 2000; A. Walker pers. comm. ; S. Wallace, pers. comm.) seemed to indicate that the introduction had been unsuccessful. The frozen specimen from 2005 was 234mm fork length (264mm total length) and 129.8g in weight and was aged from scales as being 5+ which meant that it could not be one of the original fry, indicating that the original stock had bred and indeed probably gone through several generations. Thus it seemed likely that there may be an established population in Loch Earn. As the Bassenthwaite stock is almost certainly extinct (Winfield et al. 2007), such a population has substantial conservation value and, perhaps, could eventually be used to restore vendace to Bassenthwaite Lake, once conditions there have improved. The vendace is a silver, streamlined fish living for up to 6 years and reaching lengths of between 20 and 25 cm. They live mainly in shoals occupying deep water during the day, rising to the surface at dusk to feed and returning to the deeper waters at dawn. Water at least several metres deep is required to allow the fish to escape the stresses of summer heat, oxygen depletion and predation by other species. Spawning occurs in November and December in the shallow, gravel margins. Fertility varies with size ranging from 1500 to 5000 eggs per adult female. The incubation period is long, varying with temperature, but is generally greater than 100 days. During this time the eggs, which are about 1-2 mm in diameter, are susceptible to siltation. Unlike salmon, the vendace does not cover its eggs with gravel. Therefore, the eggs are also susceptible to predation. On hatching the young are free and able swimmers of 7-9 mm in length. They have a small yolk sac, which is absorbed within the first few days, and they feed on zooplankton, their main diet throughout their life. The vendace normally reaches maturity after 2 years. In northern Europe, where the vendace is widespread, there are significant commercial fisheries, especially in Scandinavia. The British Isles lies to the southern limits of the distribution of vendace. Only a few sites are capable of meeting the requirements for relatively cool, oxygen-rich and nutrient poor water. If by some chance you land one of these fish handle with care (wet hands first before handling) quick photo if possible then return and lastly let us know about it.